← Women and Back Pain: How to Treat it! Sciatica is simply defined as pain in the distribution of the sciatic nerve, and it is one of the most common conditions seen by a spine specialist. I frequently see patients at the Center for Spine Care who have sciatica. 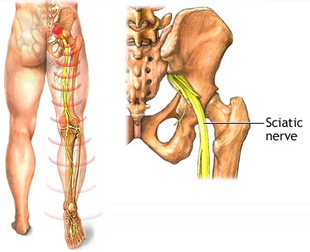 The sciatic nerve is actually a bundle of nerves that originate from the lower nerve roots of the spine (L4 to S3). Its main functions include supplying motor function to the muscles of the leg and transmitting sensory information from the leg to the spinal cord. The most common cause of sciatica is radiculopathy caused by impingement of a nerve root by a herniated disc or bone spur in the spine. Other common causes include arthritis in the spine, stenosis or narrowing of the spinal canal, muscular strain or spasm, and generalized inflammation of the spine or its supporting structures. Fortunately, sciatica is typically short lived, lasting only 6 to 8 weeks in the majority of patients, and usually responds readily to conservative care. Typically, a course of physical therapy and anti-inflammatory medications is recommended as first line treatment. Steroid injections can help the symptoms resolve more quickly by reducing inflammation of the nerve and can also help confirm the cause of the sciatica. A small percentage of patients will fail to improve and, when a specific nerve impingement is confirmed by MRI or CT scan, minimally invasive surgical options may be appropriate. Typically this involves minimally invasive discectomy or minimally invasive decompression of stenosis.